The correct deployment of software objects over the computational resources has a significant impact on the software performance. Achieving the optimal deployment manually is a tedious work as there are many different alternative solutions. In this paper a heuristic algorithm for optimizing the deployment of software objects is proposed which evaluates each deployment in the search space, considering its communicational and computational delays. In order to estimate these delays for an object deployment, our algorithm takes into account both the resource capacities and the execution load of the software for a given input-workload. The execution load of the software is measured by simulating the software use-case scenarios using the Finite State Process (FSP) models. From the simulation, the values of some metrics such as utilization, population and mean response times corresponding to the objects and threads participating in software use-case scenarios are recorded as the execution load indicators. These recorded simulation results are subsequently applied to estimate the goodness of a deployment in the search space. Keywords: Software Performance Engineering; Object Deployment; Load balancing algorithm; Simulation. The performance of a distributed software system has always been of critical importance to the designers of such systems. Software Performance Engineering (SPE) aims at detecting and predicting performance problems at the early stages of development process by evaluating the software design or deployment using simulation, modeling or measurement . There has been many works in automatic generation of performance models from software architectural models and then analyzing these generated performance models to locate the performance problems . In order to solve these performance problems at design level, one approach is to manually optimize design decisions represented in performance models . However automated techniques for optimizing the distributed software design or deployment with respect to performance have not been researched much so far . One of the important factors affecting the performance of a distributed software is the way that software objects or components are assigned to the computing resources. For instance, deploying certain objects on the same computing node eliminates the network delay caused by message passing. Co-locating objects and resources they may need such as files, devices or special network links can also reduce the network delay. Furthermore, careful assignment of object replicas can lower the overall network delay caused by remote access to those replicas from other objects. 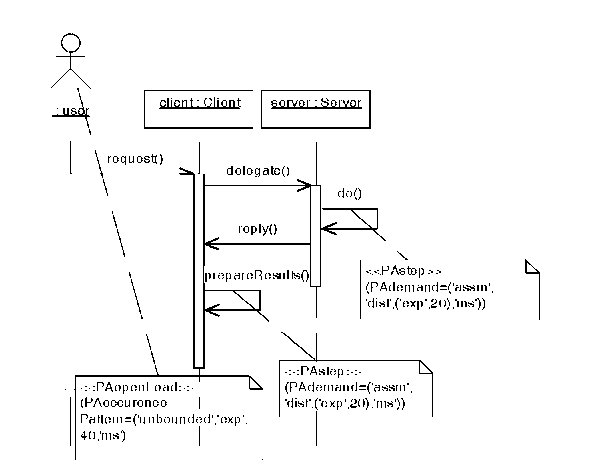 The evaluation of each object deployment within the search space requires estimating the "communicational delays", as a result of remote communication among objects, and the "computational delays", as a result of sharing the same resources by deployed objects(i.e. resource contentions), corresponding to that deployment. In the field of deployment optimization, estimating these delays using only resource capacities ( e.g. CPU Ins/sec or link bandwidth) has been research in many previous works. The main contribution of this paper is to incorporate the software execution load statistics in evaluating the communicational and computational delays of a given deployment during the optimization process. To achieve this, the value of some metrics such as object utilization, number of object or thread instances and mean response times of object invocations are required and obtained by simulating the intended use-case scenarios before applying the deployment algorithm. The simulation is performed by transforming each use-case sequence diagram, annotated with performance information according to the UML Profile for Schedulability, Performance and Time (SPT profile) , into a set of Finite State Processes (FSP)  and then executing them by means of a discrete event simulator tool. The proposed optimization algorithm is a hill-climbing algorithm that not only considers the processing and bandwidth capacities of network resources when evaluating an object deployment, but also takes into account other aspects affecting the performance such as the possibility of concurrent execution of objects and threads. Most SPE researches are focused on analysis of an existing performance model and there are few works that fall in the category of performance optimization of software. In  a Response Surface Method (RSM) for optimizing software performance indicators in presence of simulation results is proposed and its usefulness for minimizing total cost in a capacity planning problem is evaluated. However the usefulness of this method for complex optimization methods such as deployment problem has not been researched. In the field of deployment optimization, which is the main focus of this paper, there are some previous works:  is one of the earliest works in the field of deployment optimization in which a static task allocation method is proposed. However, they have not studied the effect of incorporating the software execution load statistics in the allocation procedure. In  a comparison between two deployment optimization methods: Binary Integer Programming and Genetic algorithm is presented. While reaching an optimal deployment, in this approach only the number of messages between components is minimized. In  a Linear Integer Programming-based method is used to find the optimal deployment of a set of components over computing resources. In this approach the main objective is to minimizing the computing and network delays. In  a deployment strategy for software objects based on placing the most communicating objects in the same machine is presented. To achieve this, an object graph construction algorithm and a partitioning policy for this graph are presented. In  the optimization of architectural models for multiple quality criteria using evolutionary methods is presented. Here, data transmission reliability and communication overhead are the only quality criteria considered. However, our work considers the "computational delays" in addition to the communicational overheads to achieve the best performance. In  a multi-criteria genetic algorithm for optimizing the software architecture for performance, cost and reliability is presented. In this work, the search for the optimal architecture is performed considering a number of degrees of freedom. It means that the architecture can change only along directions that preserve the functionality (e.g. changing the deployment or choosing among a set of alternative components with the same interface). In this work for evaluating the performance of each solution (architecture) within the population, the genetic algorithm generates an LQN instance from the architecture model and analyzes it using a solver. This is very time consuming method and cannot be applied to a large software with many components. However in our work the evaluation of each deployment is performed using a fast performance function (see section 4) based on previous simulation statistics. In overall, previous works in the field of automatic deployment is dedicated to the placement of software components over a set of computing nodes without considering the effect of execution load statistics when computing the communicational and computational delays for a deployment. In contrast, in this paper a methodology for deployment optimization of a set of objects, collaborating to realize some performance-constrained use-cases, using previous simulation records is presented. Minimizing the network delay between components, which is the focus of many previous works, is crucial however is not sufficient. Imagine that you put two components c1 and c2 on the same node N to reduce the network delay in between, however by doing this you might have increased the overall response time due to limited capacity of node N.
The main objective of many existing deployment optimization algorithms is to distribute the "execution load" of the software over available resources such that better performance is achieved. However in these algorithms the "execution load" of a software is estimated poorly (for example in  the number of instructions in each component or task is assumed as its load). We believe that the "execution load" for a software should be estimated by runtime indicators rather than static ones. Since we are solving the deployment problem at the early stages of software development and the only thing we have at this stage is the software models (not code), a simulation method has been chosen to predict the "execution load" of software. We have estimated this load for a use-case scenario based on these runtime indicators: (1) The population of objects or threads, (2) The mean response time of active objects and (3) the average utilization of objects. These three indicators are measured by simulating use-case scenarios for different input rates. Since the three indicators mentioned above may have different values for different input workloads to the software, it is concluded that the "execution load" of a software changes for different input workloads. Therefore it is reasonable to find an optimal deployment for each input workload separately (see the experimental results). Figure 1 gives an overview of the deployment methodology presented in this paper. The actions in the above processes, e.g. 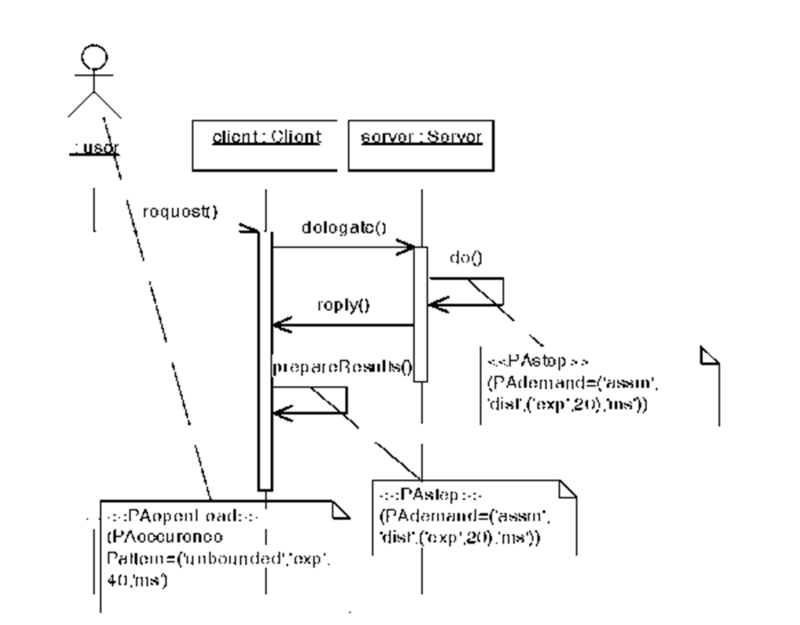 request, delegate, reply, prepareResults and do are encoding the messages specified in the sequence diagram. In addition, the time delays specified in the sequence diagram using SPT annotations, are translated into time delays in the corresponding FSP processes using <?exp(1.0/x)?> shorthand by which an anonymous clock is set to run down for an exponentially-distributed time with mean x mili-seconds. The resulting FSP,s then were simulated by means of LTSA. is minimal where are the starting invocations of use-cases u!,u2,…,un respectively. The coefficients fi,f2,.,fn indicate the relative significance of use-cases u1,u2,..,un from the performance view point(defined by the software architect). Where aj is the communicational delay of Ij when it is a remote invocation (i.e. 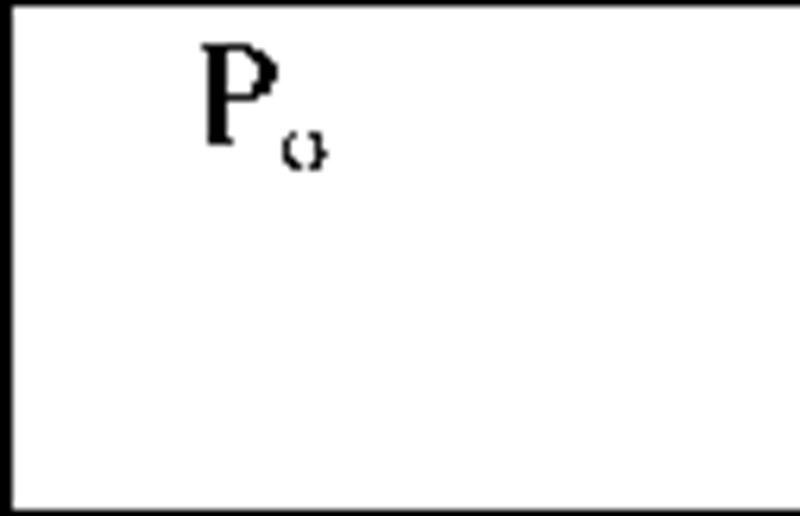 |ij,d=1). Note that computing the value of Lj(d) may require that the estimated execution time of other invocations (or synchronization points) located between the initiation point(Point A in Figure 3) and the synchronization point of Ij(Point B in Figure 3), be computed recursively.